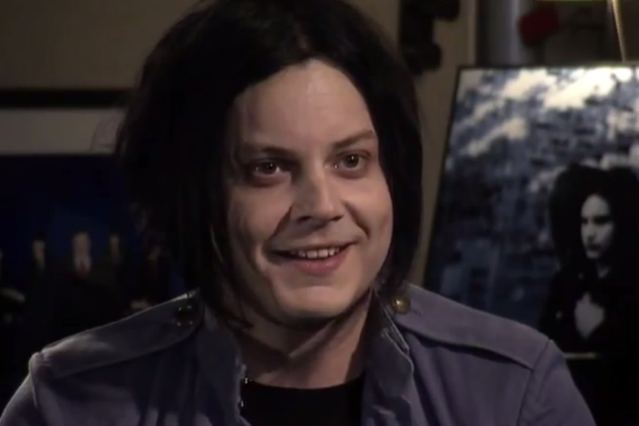 Jack White and Stephen Colbert aren’t exactly strangers to each other. The former White Stripes frontman, who just released a nominal solo debut, Blunderbuss, that we really like, has previously been game for a two-part interview with The Colbert Report’s faux-conservative host, and White’s Third Man Records even put out a single featuring Colbert backed by goth-rockers the Black Belles. Last night on the Report, White ripped into Blunderbuss stomper “Freedom at 21,” the single he initially let loose via helium balloon. He yowled and soloed with impeccable panache, but in an earlier interview segment, he confirmed to Colbert that only five of those fantastical balloon-singles have actually been found. In truth, the chat was a non-interview: The conceit was that White declined to do an interview so Colbert did a backstage “run through” with him and aired that instead. Tons of credit to White for once again not trying to out-funny his host — the awkwardness has always been part of the genius of Colbert’s interview — but there’s only so much comedy mileage you can get out of awkward tedium before it gets, you know, actually tedious. We did learn that Colbert’s Black Belles single isn’t out of the Grammy running yet, that White calls Colbert a friend, and that Colbert does a mean impression of David Lee Roth’s wonderfully ridiculous vocal track for Van Halen’s 1978 “Runnin’ With the Devil.” Must be time for these guys to make another record together.